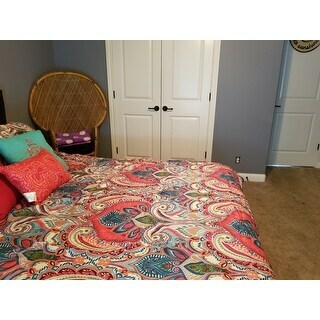 Very nice comforter set, a really great value. The decorative pillows are very cute and are a nice added touch. The colors are much brighter in person but I really like how vibrant they are . There is orang mixed in with teal and coral. This set is woven from soft polyester in an eye-catching pattern and is fully machine washable. The polyester fill makes this a perfect, light summer comforter. Set includes a comforter, two shams, and two elaborately decorative pillows. Comes in two different color patterns, blue and coral. 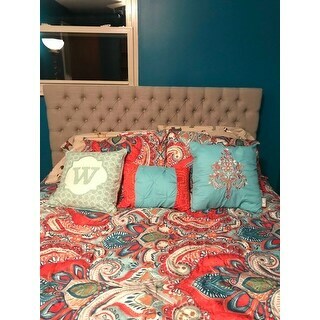 The colors are vibrant and the comforter material is of good quality! The pillow shams were significantly larger than the ones from my old set, but it is probably because I sized up from a queen to a king. I love the set! Beautiful and very vibrant colors, it has brighten up my bedroom decor. Absolutely love how many colors are in this set that can mix and match other decor pieces.. The colors are so vibrant!!! 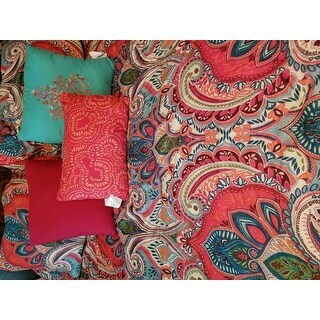 I just love this bed set..great quality..well worth the price!!! The throw pillows are really nice! I am happy each night to get in bed!! So I received my delivery a day early. After removing everything from the packaging and checking all pieces, upon sight I was visually pleased. After which I felt the texture and it felt very good to the touch. I have a Queen size bed, whenever I purchase a comforter usually my preference is King size. After spreading the comforter and placing the pillows on the bed to get a better visual, again I was visually pleased. More so now that I can see it on the actual bed. This particular color is going to look wonderful during the summer months! I would definitely advice family and friends to make this purchase!! I placed the comforter / pillow cases in the washing machine. Once it was done , I shook it out before hanging to dry. I'm just so happy. I bought this for my daughters room. She decided on this and I went with what she wanted. Looks fantastic. It is light and great for Spring/Summer/Fall. You would want a blanket for cooler months. Added the pizzaz we wanted. It feels more like cotton than polyester. I am happy with it. My order came today and there were only 3 pieces, Comforter and two sham cases. No Decorative Pillows. Really pleased with the color. Really annoyed that it didn't come with the pieces I paid for. Hopefully Overstock.com will make it right. 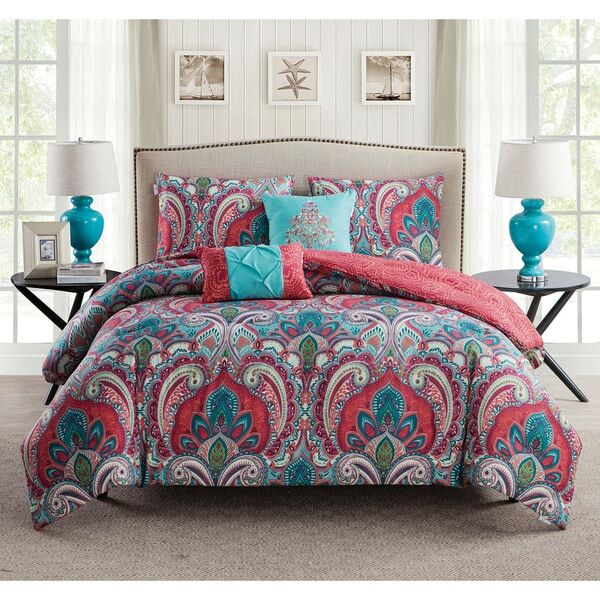 The colors are fantastic on this comforter set. The comforter is a good thickness and does not bunch up after washing. The 2 extra decorative pillows are very cute and pull the entire set together. The colors are turquoise and coral they really make room pop. The conforter is not thick does come with 2 little pillows and a sham. Love iy. Love, love, love this comforter! The colors range from bright coral and turquoise to muted aqua, pink and white, so it fits in easily with most any decorating scheme. Material is nice, not at all scratchy. Great price for the 5 piece set and the accent pillows are adorable. This bedspread makes me happy! The colors are so vibrant and fun. I feel like an exotic princess sleeping. I would recommend this comforter. We bought this comforter set for our granddaughters room.Very good quality.Looks great. Very soft and much thicker than I thought it would be. Bright colors. Stitching in comforter started to come apart after only one wash at a professional cleaner. Wouldn’t recommend. Looks great but it is gathering around the edges and I can't straighten it out. The stuffing inside is forming clumps. I will probably get a different one. Beautiful and washes in the machine VERY WELL!! it is still soft and gorgeous after 5 washes. I love the colors of this set &amp; that is the reason I ordered it! Does not wash well, or dry well. Stuffing bunches terribly &amp; fabric shrinks. Do not recommend buying for a K bed! Buy a K size for Q size &amp; you would be OK. Colorful, brightens up our room in our trailer just great! It's new but decorated in beiges tones. TT are ment to be fun so we brighten them up with color. I love that it is light weight. Colors are gorgeous. Very happy with purchase. The pillows are an extra plus. Very cute! This was a great price. It looks great in the bedroom I was looking for it to complement. I would recommend it. I have even washed it and it holds it form. Beautiful comforter. I absolutely love it. Very well made. Worth every penny!!! Very warm, fits my queen sized bed perfectly!!!!!!! I couldn’t be more pleased. So nice my sister tried to take it from me. "Is the background on the blue color option a gray or tan color?" It is a combination of a lot of color including blue, and possibly some grey. "I can't locate the dimensions of the quilt in king size. I have a 12" thick mattress so it needs to be wide." "I've been trying to stay away from polyester bc it doesn't breathe. Is this comforter hot? What is the weight?" 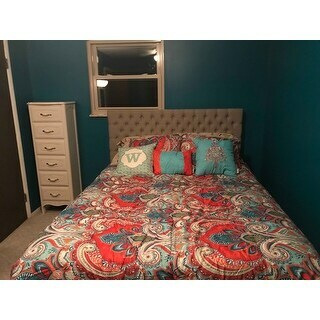 "does it come with sheets and pillowcases"
No it doesn't, but i ordered a set a teal sheets from overstock to match. No, it doesn't. Comes with 2 shams, the comforter, & 2 throw pillows. Yes there is leaf green in this comforter but only accents here and there. You can see them in the picture of the product. I have this with cream colored sheets and a burlap tufted headboard for my teen daughters room. It is beautiful!! Yes, it has multiple shades of green. "Is it soft or scratchy "
"My daughter has a full/queen bed and I want to know if I should buy the full/queen or the king. Does the comforter fit according to the bed size perfectly or should I go up a size. Thanks"